Here is a really sweet treat to share with your loved ones. We all know that I love my sweets and this one is high up on the list of favorites. It is so simple, has so few ingredients and yet so addictive. I repeat….this is ADDICTIVE stuff. So, it is perfectly sweet to share with all those around you. 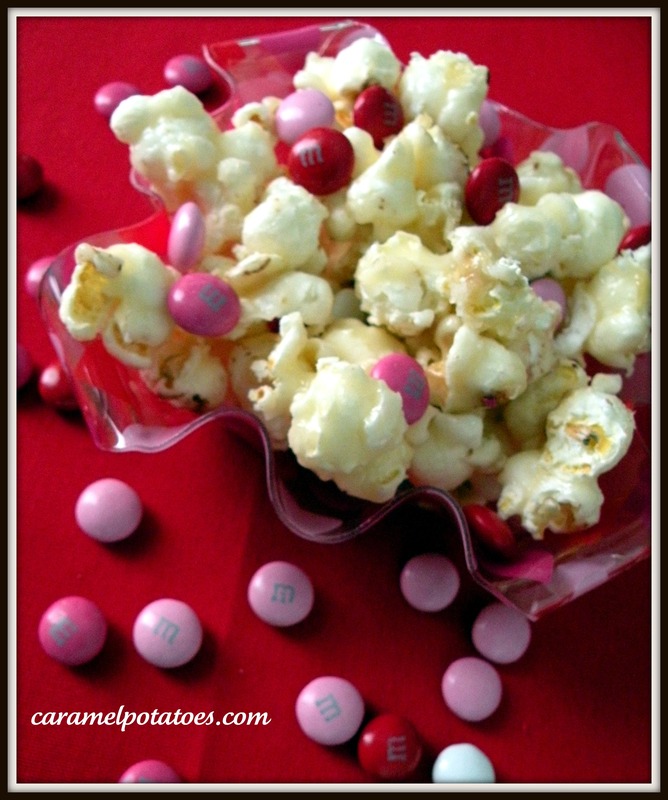 It makes a great little Valentine treat. Be sure to try this one and make someone’s day a little sweeter. Everyone enjoys a good treat now and then. Place popcorn in a large, heat-proof bowl. Remove from heat and stir in the vanilla. Pour over popcorn and stir to coat. Once slightly cooled you can add in m&ms if you like. Add as many or as few as you like. 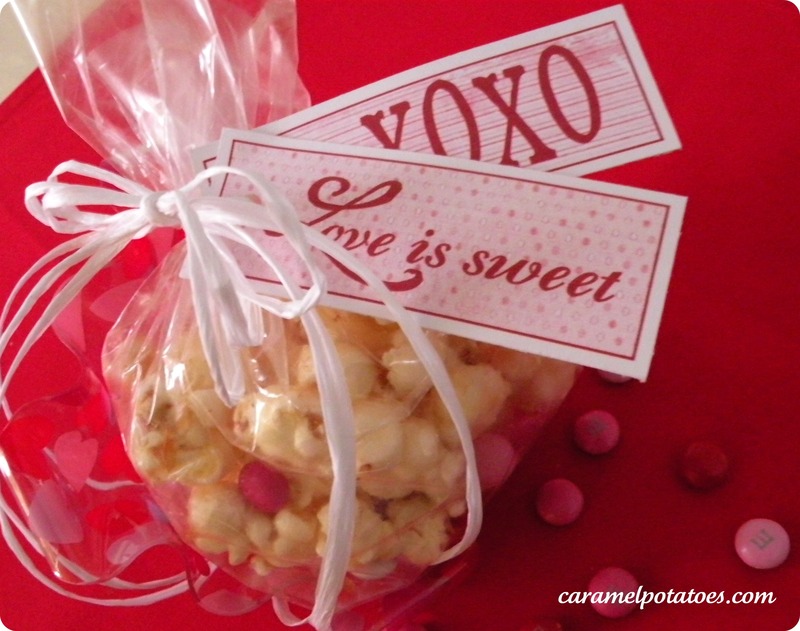 This popcorn is perfect to share with someone you love. The gift tags below will let them know how much you care. Breaking Dawn is my favorite at the moment. I LOVE your blog! You two are doing a GREAT job!!! I have LOTS of favorite movies, but my favorite one right now is YOUNG VICTORIA. I will always love While You Were Sleeping. I really like Pride and Prejudice. I love When Harry Met Sally! I likes Caramel Potatoes on Facebook. The African Queen is my all time favorite movie! My favorite is Lord Of The Rings! I liked the caramel potatoes on facebook. I don’t really have a favorite movie. But I would really like to go see a movie. It has been years. All time favorite movie would be My Fair Lady. 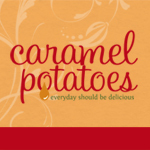 I’m following caramel potatoes on pinterest. Pride and Prejudice – the newest release. I can watch it over & over & over!! Reel Steel -I have all men/boys in our family! My favorite movie out right now is Sherlock Holmes…he always keeps you guessing. Godfather is my favorite movie. Day and Knight, and Godfather are my favorite! My favorite movie is It’s A Wonderful Life! My favorite flick so far is National Treasure. I signed up for email. Hit you on facebook..really like the twilight series! My favorite is The DaVinci Code! Lord of the Rings (all three) are my fav! My favorite movie is The Power Of One! Thanks so much for the fantastic giveaway! All time favorite – Steel Magnolias, what a cast! Favorite flick I’ve seen recently was War Horse. Favorite flick of all time is The Godfather. Fight Club is my favorite movie. My favorite movie is The Darjeeling Limited. My mom and I just went to see War Horse and that is my current favorite movie. My favorite movie is Forrest Gump! My favorite movie is Say Anything. One of my favorite movies is Terms of Endearment. It’s been over a year since I went to the movies, thanks for the chance! I love Pirates of the Caribbean. My fav. film would be either Chicago or Moulin Rouge. My favorite movie is Powder. my favorite movie is gone with the wind! My favorite movie is Cold Mountain! My favorite movie is Harry Potter and the Sorcerer’s Stone! Hmm, I’ll go for a movie that is my favorite that I can watch over and over. I love your blog! My favorite right now is Thor! My favorite flick that I can watch anytime all the time is Shawshank Redemption. My Big Fat Greek Wedding! My favorite flick is The Saint….love Val Kilmer. I love so many movies, its hard to choose. So I will go with Fireproof. I subscribed to your emails…your blog looks excellent. Burn Without Reading is my favorite. It always makes me laugh. My favorite? Gosh, I don’t know! Hmmmm… I love 50 First Dates! I like you on FB as Wendy R.
One of my favorites is Where The Heart Is. My favorite movie is The Help. My favorite movie is the notebook. My favorite is Monty Python and the Holy Grail. My faviorite is The Fifth Element! My favorite movie is an older one–1776. My favorite movie is Pirates of the Carribean 4! I subscribed to your newsletter/email. My favorite is The Conformist, by Bertolucci. I really like the movie Courageous. I love Meet the Parents! My favorite movie of all time is “The Money Pit”. It makes me laugh over & over. Thanks for having this giveaway! Loved “Ghost” with Patrick Swayze and Demi Moore. I’m old school…Dirty Dancing is my all time favorite movie! My all time favorite movie has to be Gone with the Wind. My favorite movie is currently Everything is Illuminated. I Like you on FB as Terri Winsome. I’m a new email subscriber. My favorite flick is currently “The Help”! I liked Caramel Potatoes on Facebook as Sharon Wheeler Whitaker. I love The Sound of Music! It’s been my favorite movie since I was a kid. I just found your wonderful site through Tip Junkie and subscribed through email! My favorite movie right now is Bridesmaids. My favorite movie is Pirates of the Caribbean. The Breakfast Club—I love that movie! I have always loved The Sound Of Music. My all time favorite movie is Magnificent Obsession. My favorite movie is Memento. My favorite movie is Dumb and Dumber! Thanks for the contest! My favorite movie is the 1978 version of Halloween! I highly recommend “Things to Do in Denver When You’re Dead.” Quirky, funny and just downright odd. My favorite recent one was “In Time”. I can’t think of an all-time favorite! My fav is Say Anything! Love 80s movies! My alltime favorite movie is Employee of the Month. im a huge fan of the movie newsies. i can quote the entire thing! my favorite movie is courageous. I love Fight Club and since I have a 4-yr old princess, I love Tangled now! My favorite is Pulp Fiction. Grease is my fave movie! like your page on FB – Marianna B.
I like all the Transformer movies. Gone With The Wind is my favorite movie of all time. Going the distance is one of my favs. My favorite is 16 candles. Thanks for the giveaway. Just liked you on FB same name! I just subscribed to the email!! i have always loved the movie the fall. Pay It Forward is my favorite. The original “In Laws” flick with Alan Arkin and Peter Faulk. We just saw Hugo and loved it! So charming and delightful! I Love You Man…LOL everytime I watch it! I have always loved An Officer and a Gentleman. I have favorite movies every month. I love watching movies. I can’t wait to see Underworld Awakening. I love that series. My favorite movie is … Summer Catch with Freddie Prince Jr. I have liked it on my facebook account. My favorite movie right now is Warrior. SO good! Forest Gump. I’ve seen it so many times and still love it! FB name is Sandy Saves. Hmmm I haven’t been to the movies in a while.. But I loved Puss in Boots! Favorite movie is Home Alone! I love the movie training day. So many movies, so little time! I guess my favorite of all time is Titanic. I watch it often. one flew over a cuckoos nest ty. Little Women is a favorite. Thanks!! Favorite movie is the new Beauty and the Beast 3D! Awesome! For relaxing I like You’ve got Mail. i love Overboard, Far and Away, and Big equally! My fave movie of all time is Billy Elliot! Subscribed to email subscription as well. I like Gone with the Wind! This past year my favorite movie was 50/50. The help is my favorite! Can’t pick a favourite, love movies! My favorite movie of all time is Groundhog Day. I have a series of favorite flicks and “Pride and Prejudice” is on that list. I just found your site today through a link on Tip Junkies for the red velvet crepes. I really can’t think of a favorite movie at the moment. It has been awhile since I have seen movies that I want to see. When I got to see a movie it is usually with my kids, so it is their choice of movie. I Like you on FB as Matthew P.
Just subscribed thru google reader. My favorite movie is Titanic. But, I also really liked Love Story. I love While You Were Sleeping. I love seeing movies on the big screen! My favorite is Strictly Ballroom. Gone With The Wind is my favorite. At the moment my favorite movie is Sherlock Holmes! The Princess Bride is my all time favorite, but we loved the new Sherlock Holmes! Thanks for the popcorn recipe! My favorite movie is any movie that’s based on a Austen or Dickens novel. My favorite movie is The Fighter.